"I shall not be surprised if that strong fortress Allahabad, with all its valuable stores and war munitions, has fallen into the hands of the insurgents. That would indeed be a climax to our misfortunes, more serious than the seizure of Delhi." Today I am writing about a prominent figure of our historical struggle known as the 1857 uprising or MUTINY of 1857. It is not easy to write about a person who has almost been forgotten and who memory has been left for the wayward infrequent historians because we had not only lost the war, we had lost the sense of record keeping as well. On the contrary no effort was spared by British writers to besmirch the memory of the martyred heroes of Indian struggle. Therefore it is not easy to distill from the turgid accounts the limpid truth of a man who lived 150 years ago. Maulvi Liyaqat Ali who has secured a safe place in the history of Indian freedom struggle was a genius organizer who had evoked waves of enthusiasm, like the full moon stirs the sea, through his words & actions throughout the Doab, was a native of Allahabad. He is remembered by the British writers as a man of considerable influence and authority. The word ‘Maulvi’ was synonymous to ’rebel’ in the British eyes. Out of approximately 200,000 people martyred during the revolt, more than 50000 were Ulama. Some claim that in total 5000 of Ulama were hanged to death. Before going through the life and times of Maulvi Liyaqat Ali, let us have a look at the conditions and precursors that prompted the uprising in 1857. In the annals of modern Indian history, the year 1757 was a watershed year when Robert Clive defeated Siraj-ud-Daulah of Bengal at the Battle of Plassey. Exactly 100 years after this historical event, the Sepoy Mutiny of 1857, or the first Indian War of Independence as Marx called it, infact cleared the path for the British monarchy to take over the reins of India from the East India Company, which had established its control over large part of the country over the preceding 100 years. We may call it Sepoy Mutiny or India’s First War of Independence or the last gasp of Indian heroes there is little doubt that it was a cataclysmic event that had an everlasting effect on Indian Polity. After the British annexed the kingdom of Oudh in 1856, many sepoys of the Bengal Army—who actually hailed from the areas comprising Utter Pradesh and Madhya Pradesh—felt that their traditions were being trampled upon. When the East India Company issued new rifles along with cartridges greased with the fat of cows and pigs both Hindus and Muslims were outraged. On May 10, 1857, at Meerut, 85 soldiers, who had been chained for refusing to use the cartridges, were freed by their comrades. Though most history texts describe this revolt, which originated from Delhi, Meerut and Lucknow, as seeking to re-establish Mughal rule, there is more to the uprising. It was more than a mere Sepoy Mutiny or to say some dethroned pensioners struggle. It was actually an eruption of the social volcano wherein many pent up forces found vent. After the eruption the whole social topography had changed. Besides the sepoys and few princes, millions of common man participated in the rebellion. In the roll-call of the killed, common man were more frequent than the sepoys. The Revolt took place everywhere in the name of one sovereign , the emperor Bahadur Shah and under his flag. Hukum Sipah ka or Hukm Maulvi Sahib ka! Liyaqat Ali was born in Mahgaon, a village in tehsil & pargana Chail of Allahabad. His was the only son of Shaikh Mehr Ali of Dakkhin Thok (Southern part) of Mahgaon. His Grand-Father's name of Shaikh Ali Muhammad. His uncle was Shaikh Daim Ali who was employed in the British Army stationed with the army of the Raja of Jhansi. Liyaqat Ali would have been born between 1810-1830 AD. This is a conjectured time line as it is mentioned in some reports that he was around 40-50 years old at the time of rebellion. Thus we can surmise that he would have been born around 1810-30. Some writers have mentioned 17th July 1823 as his date of birth while others have claimed 5th October, 1817 as his year of birth but I am sorry that these are all baseless as there is no document to prove any date or year of birth of Maulvi Sahib. It can only be guessed but should not be guessed wildly. Any particular given dates are simply wild guess. I don’t know who has spread this rumour that the forefathers of Maulvi Liyaqat were big landlords and owned numerous villages, some have gone further to claim that they owned 46 villages .To me this is the biggest lie regarding the life of Maulvi Sahib that goes against all the documentary evidences. Even Dr.Bhatnagar who has authored a book on Maulvi Sahib recently has included this lie only on the basis of hearsay. I would like to know from Dr.Bhatnagar or the other claimants the source or the official records where this is mentioned. I have checked thoroughly and found no such document. It is clear from the documents after his capture that he was from a very modest background and to call spade a spade, he was from a very poor family. This fact has been ratified even by the British chroniclers that he was from a modest background. The enquiries made by the British after the tumult clarified that his father was a peasant, a moderate farmer. His uncle Daim Ali and even the Maulvi Sahib both had served the British Army. If someone had 46 villages then nobody would go to serve the alien armed regiment in an alien place. Even Maulvi Liyaqat Ali in his defense mentioned that he was from a very humble origin. It is also noteworthy that Mahgaon was the only large village of Chail where the inhabitants had no zamindari rights since the time of Asaf-ud-Daula. This can be verified from the revenue records available at Tehsil. The British under the waves of sheer hatred and disgust claimed that he belonged to the weaver Caste (Julaha) and all the people who supported him were also from the low class. This is the first but the weakest lie which had been refuted during his life time. As a matter of fact he belonged a highly respectable Jafri Shaikh family of Mahgaon which had its origin in MachhiShahr(Jaunpur) via Ghazni till Makkah Al Muazzama. If we go by the hierarchy of the families, he was from one of the class-I clan of Muslim Gentry. 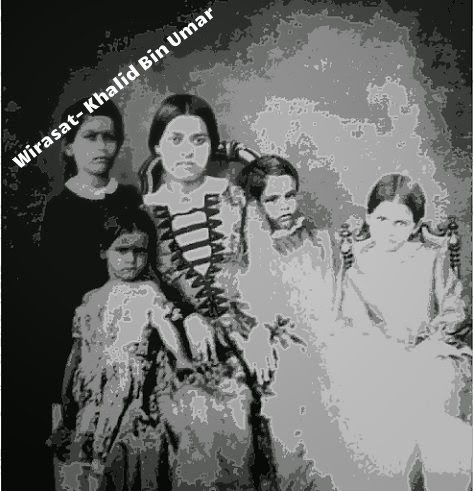 The ancestor of this Jafari family came from Arabia via Ghazni and settled in Machhlishar from where one of the off-shoots came to Mahgaon in the beginning of the 17th Century AD. Later on their own British inquiries revealed that he was from the respected Shaikh Families of Mahgaon. See the excerpt below. I would like to clarify one small but very important point that he was not a Syed as claimed by almost all the post independence authors. Nowhere in the entire pile of records is he mentioned as Syed. The Original Shajra at Mahgaon also does not mention word Syed for the entire family and the fact is that nobody in Mahgaon ever used the word “Syed” ever. Though this family had marital relations with Syed families of environs but they themselves were not Syed, in the strict sense of this term. Another falsehood that his forefathers came from Khurasan and were appointed Qazi – is wrong. The fact is that his Forefathers came from Ghazni and settled in Machhli shahar Jaunpur they had nothing to do with Khurasan at all. As I stated earlier he was from Jafri Shaikh clan of Mahgaon, Pargana Chail which came from Machhli Shahr Jaunpur and from there they came from Ghazni. Maulvi Liyaqat Ali was born sometime between 1815-1830. No authentic DOB is available. He was a Jafari Shaikh by descent. Jafris are the upper class Muslims. He was not a weaver. He was from a respected but modest rather poor financial background. There was no zamindari in his family and his father was a modest Kashtkar while his uncle was a soldier in the British Army stationed at Jhansi. His father or any of the grandfathers were not Qazi and none of his immediate ancestor was known or called a Qazi. His family originally came from Machhlishahar( Jaunpur ) and there they had come from Ghazni and there they had come from Makkah al Muazzamah. Nobody came from Khurasan. His family is Syed – A Lie, though the family is very high ranking & married Syeds. He was captured at the Bombay VT Railway station. - A lie , it was Byculla Station. He died at Rangoon. - A lie - He died at Corbyn's Cove , Port Blair. This way I want to refute the so called claim of some modern thinkers that all the leaders of the 1857 uprising were fighting for their own benefits, pensions and lost estates. Maulvi Ahmadullah Shah, Azeemullah Khan, Maulvi Liyaqat Ali are all the torch bearers of 1857 and they were all from almost obscure origins. I do not agree with the view of some so called thinkers that if Tantiya Tope, Rani Laxmi bai were fighting for their lost riyasat, everyone was like them. The facts do not support the view in its entirety. There is no doubt that the events of 1857 certainly coalesced feudal interests with the rising popular resentment against the firangi. This eventually metamorphosed into a powerful and focused nationwide movement. I would quote few authentic voices of our historical literature who agree that it was a national patriotic movement. There is no doubt that the objective of the entire exercise was to drive out the British and establish the Desi Raj. This is evident by different proclamations by Emperor Bahadur Shah Nawab Birjees Qadr, Khan Bahadur Khan of Bareilly, Nana Sahib and Liyaqat Ali of Allahabad. All of them showed deep enthusiasm, sincerity and the scale of hardship they went through is enough to substantiate that it was a patriotic struggle rather than actuated by some self interest. We understand that Maulvi Liyaqat Ali learnt basic Arabic, Persian at his village while he travelled to Allahabad city for further studies as per the curriculum prevalent those days. It is reported in some books without any reference that one of his teacher was a pupil of Shah Abdul Azeez of Delhi. There are reports to suggest that he was a complete and proficient Aalim (Qualified Islamic Scholar) who taught firstly at Mahgaon and later on at Allahabad. Maulvi Liyaqat Ali was attracted towards martial arts since his childhood and as his uncle was employed in the British army stationed at Jhansi, he was naturally inclined towards his Uncle and asked him to get him a job in the army. It is reported in various accounts that he was employed in some of the British regiment where he honed his skill as an swordsman and rider and learned new techniques of martial arts as an add on. It is further reported that he was disappointed by the ways British treated Indian and Indian soldiers and he left his job after a few years of service. On the contrary the British reports say that he was dismissed from his service on account of his mischief and disobedience and inciting seditious activities in the army. Whatever the actual reason might have been, there is no doubt that he left his job and came back home but before returning he visited several places like Delhi and Tonk & Bhopal. 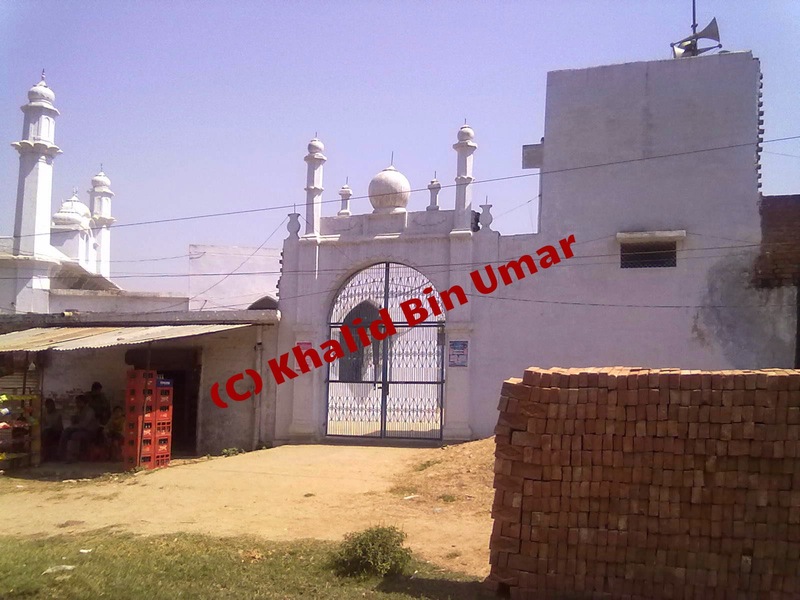 Tonk was the place where the relatives and remnants of the Tahreek-i-Jihad by Syed Ahmad Shaheed of Rai Bareli were living and it is most probable that he learned and was motivated towards the armed struggle against the British there in Tonk. He met a lot of holy men, Ulama , teachers on his way back to Allahabad via Rai Bareli. Upon return at Mahgaon he started leading prayers at the mosque in Mahgaon and subsequently started a madarsa nearby. His piety, his eminence as a Aalim and an orator reached far and students from other village/mofussils came to study at his madarsa. He used to collect the food for the inmates of the Madarsa himself going from house to house in the village. His pious life and impressive life-style had earned him great repute and the common man considered him to be a miraculous faqeer of his time. It is also reported that when he shifted to Allahabad he would lead prayers & live in the mosque which now falls inside the Allahabad Cantt. Even if this account is true, this confirms that he used to take tuition and was a not a hereditary landlord of 46 villages. Though these reports are different and despite the tremendous efforts by British writers to blemish the Maulvi they all boil down to a fact that Maulvi Sahib was a teacher in his early life and indeed a man of high respect and third point that he was strongly against the British and their occupation of India since very beginning. We cannot say with certainty as to when did he came into the contact with the so called mutineers but there is absolutely no doubt that he was connected with the entire plan from the very beginning and he did not jump into the show in between rather was closely involved and acted in full connivance with Nana Sahib, Azeemullah Khan, Bakht Khan , Maulvi Ahmad Ullah Shah, Deputy Hikmat Ullah and other key leaders of the uprising. The later records suggest that Maulvi Liyaqat Ali had several meetings with the leaders of the uprising and he was entrusted with the task of conveying the exact time & date of start of struggle at different places throughout the Doab.Hence it is also reported that he personally covered the area from Delhi to Mirzapur in such a short time personally meeting the local leaders that it could be considered impossible these days. He issued and published pamphlets with his signature mobilizing locals to stand against the British rule. He sent letters to the chiefs, landlords, Taluqdars for their support in the struggle. Such a gigantic but silent task was finished in such a covert way that nobody could believe the tumultuous amount of disruption and collapse of British Authority it resulted after the uprising broke out. Maulvi worked so hard that Charles Bill observed "the freedom of country became so great that very judges and munsifs joined the secret society - History of the Indian Mutiny vol 1 p.268. “At Allahabad the Muslims were more advanced than Hindus, they were most prominent in management of the machinery of the secret society ( India War of Independence 1857 p.174) . He writes that the native Sepoy had already made up their mind , they were waiting for the Sikhs of the Ferozepore Regiment to ally with them. This revolt against the British took everywhere under the name of the King of Delhi and under his flag. His over-lordship was not just recognized but regular reports were sent to him along with Tributes. The Emperor was the commonly accepted centre of Allegiance. Although everything was quiet at Allahabad at this time, the situation was very confused and the news of the mutiny in the north caused considerable anxiety and doubt. The 6th Regiment of Bengal Native infantry (BNI) was stationed at Cantonment, a wing of Sikh detachment ( ferozepore Regiment) and one company of the 6th Native infantry in the Fort. Colonel Simpson was the commandant of the 6th infantry. Two companies of the 6th regiment under Lieut Alexander with 150 troopers of the 3rd Awadh Irregulars were posted in Alopi Bagh, a large encamping ground near the fort. Bayly Changes the name to liaqat Hussain. On 12th May , the news of the revolt at Meerut & on 17th the progress of revolt at Delhi arrived and tensions rose in the city, European community assembled to work out for any sudden disturbance. However, no precautionary measures were considered necessary until the 5th of June, when all civilians and women and children were ordered into the fort. This was just in time, for, at 10 p.m. on the 6th of June, the 6th Native Infantry, which was stationed in the cantonments two miles from the fort, unexpectedly mutinied. The men attacked their officers in the mess and then plundered the treasury. Incendiary, rapine and murder followed. The mutineers were joined by the entire town rabble, and their savagery was terrible and continued for days. 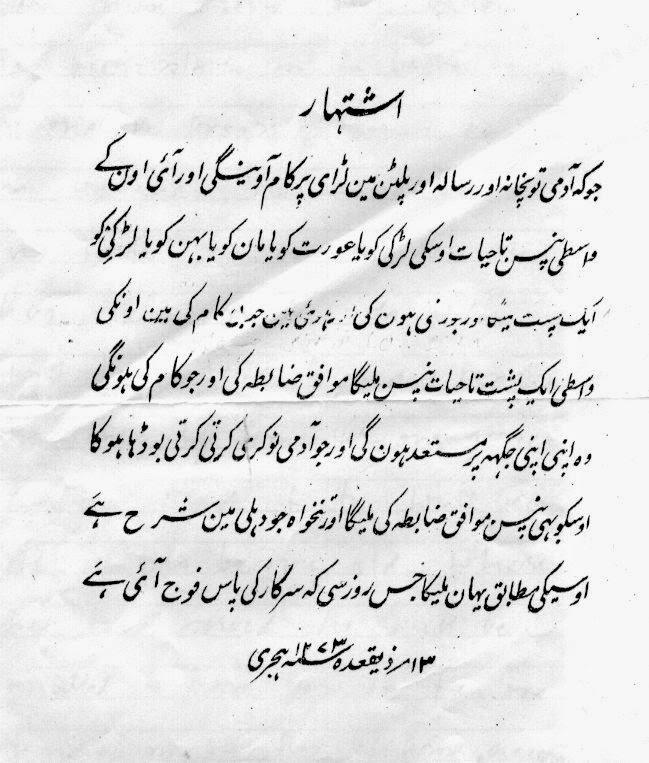 As local assemblies were organized to mobilize the common man can be seen in the case of Mewatis of Allahabad where the crucial decision to rebel was taken in mauza Samadabad in a 'panchayat of Mewatis held on 5 June 1857 at the house of Saif Khan Mewati and all, excepting Saif Khan, decided to rebel the same day. In the evening of June 6 , 1857 at 9.20 pm , the real outbreak started at Daraganj. 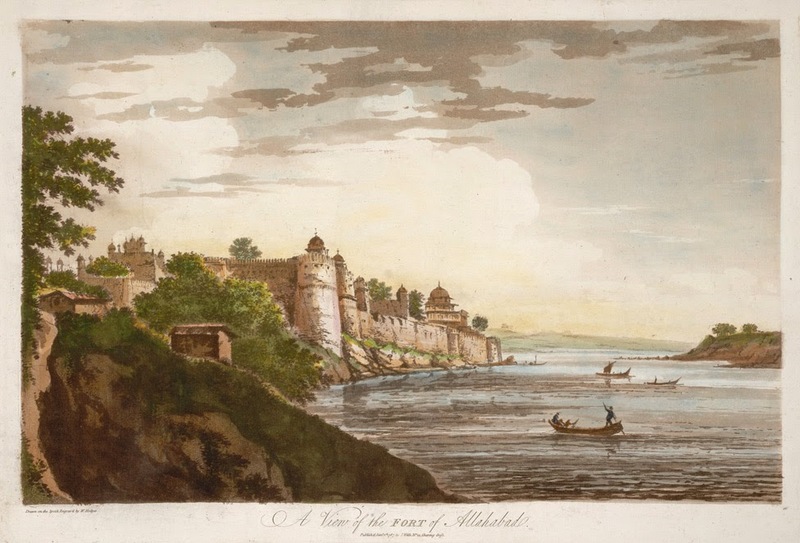 The Indian soldiers posted at Daraganj to guard the Benares bridge were ordered to take the guns on the bridge into the fort. The soldiers disobeyed, seized the guns and started dragging them to Cantonment. Lieutenant Harward tried but in vain, he went to Lietu Alexandar posted at Alopi Bagh and both then set out to punish the sepoys. They came and ordered the cavalry to attack the mutinous sepoys, To their disappointment, the cavalry did not move, signifying that they were with the sepoys. It was then become clear that an open uprising started. Alexandar was shot dead, Lieut Harvard ran for life in the fort. the native cavalry deserted and joined the Anti British crowd. Afterwards it is believed that wherever an English officer was found he was shot dead. On the 6th June, a large no of British officers had assembled in the mess room for dinner. The heard the sound of bugle , thinking that it indicated the arrival of Benares insurgents, they hastened towards the lines but as soon as they reached there, they were received with volleys and were killed except three. The sepoys then marched triumphantly towards the cantonment; they burnt the bungalows of British and indulged in murder of Europeans. All through the night of 6th June anarchy prevailed. Early next morning, the jail gates were thrown open and 3000 prisoners were released. These prisoners along with other crown and thousands of Mewatis , the railway works were destroyed, telegraph wires were cut-off, the revenue office was burnt. 6th NI captured the treasury. The leader of the sepoys was Ram Chandra and they broke into the jail releasing the 3000 inmates after raising slogans of Ram Chandra ki Jai. All the British outside the fort were put to death. The people gained control over the Kotwali and the entire British authority at Allahabad was overthrown and a Green Islamic Flag waved over the Kotwali. The Fort however continued under the British. 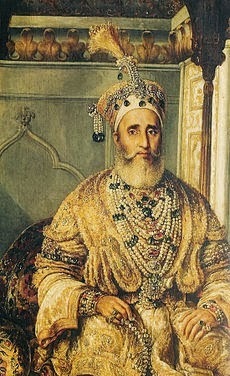 In the night the sepoys decided to carry the treasure which was reportedly thirty lakhs of rupees , to Delhi to place it before Emperor Bahadur Shah II but due to the selfish nature of the sepoys , the plan could not be materialized and everyone who participated in the plunder carried off the amount which he could lay his hands on. There is another report that the said treasure was carried away and after consultations handed over to safety to the Raja of Daundia Khera at Unnao which was recently in news when a sage had marked the place for excavation for the recovery of the same treasure. However this report is not found in any reliable book. The next day 7th of June, the leader and the organizer of the entire uprising , Maulvi Liyaqat Ali of Pargana Chail arrived and camped at Khusro Bagh. His sincere advisors asked him to save the city from destruction and plunder. He organized the sepoys, gave speeches, published pamphlets which harboured the Hindu Muslim Unity with anti-British feeling among the masses alike and soon he assumed full authority in district of Allahabad. The Mewatis of Samdabad, Rasulpur and other sepoys gathered around him and he raised the slogan of Jihad against the British. He invoked in the name of Mughal Badshah and appointed officers to assume full control of the city. A march was organized through the city and Green Flags fluttered all across the city. A green flag was hoisted at Kotwali and the sepoys saluted them. Thereafter the Maulvi Sahib had the meetings with different leaders of the city and they discussed the ways to establish the order in the city. It was decided that in order to declare the end of English rule, they should arouse the feelings of all to fight for their country & religion. Thereafter He raised a call for Jihad against the British and to convince discordant, he appealed to the masses through a proclamation, in which he declared the Europeans have been guilty of crimes of massacring, plunder and killing human beings and destroying out country. He added that the real paradise lay beneath the strokes of the sword. He quoted Quran from Surah Saf and Surah al Tawbah. Bagh-i-Firdaus hai Talwaron ke Saaye tale !! Haif is daulat Bedar se Momin Bhage !!! 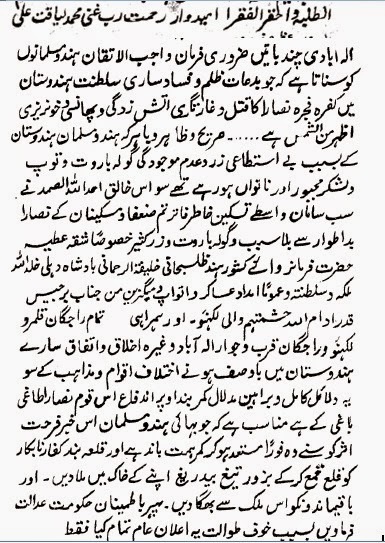 There was a famous Masnavi-i-Jihadiya by Moulvi Khurram Ali Bilhauri (D.1855) which, was very popular during the battles of Sayyid Ahmad Shahid against Sikhs Maulvi Sahib got it published and popularized this versified proclamation of Jihad (famous Jihadi Poem Masnavi) found in his Risala-i-Jihadia” (1856). , To many of the scholars, he was inspired by the philosophy of Shah Wali Ullah Dehlvi , the British rule was Dar-ul-Harb and armed struggle was a religious duty. The three proclamations were sent to G.F.Edmonstone, Secretary to Government of India, from the Allahabad Magistrate on 26 July 1857. He had received them from Mr Willock at Cawnpore. Authorization by the Emperor - The next day he declared that he has been authorized by the Emperor of Delhi as the Governor or representative of Delhi. He exhorted people to work tirelessly against the British and added that the real paradise lay under the strokes of the Sword. His speeches had the desired effect and leading Zamindars of Pargana Chail and Gangapar joined him. The reported Farman of Bahadur Shah Zafar in favour of Maulvi Liyaqat Ali appointment as Subahdar of Allahabad is preserved at the Salar Jung Museum, Hyderabad. Eminent Muslims of Allahabad joined him and were appointed officials by Maulvi Sahib. 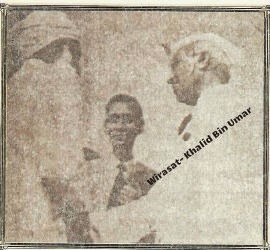 Amongst his most trusted one were Sukh Rai ( Tahsildar ) ,Shaikh Nemat Ashraf ( Kotwal ),Chaudhari Shihabuddin of Bamhrauli ( Naib),Shaikh Hadi & Shaikh Faizullah ( Both from Behka Sipah Salars),Shaikh Ghulam Ismail,Shaikh Mohammad Husain,Chaudhari Miran Bakhsh,Maulvi Syed Ahmad Ali,Maulvi Ghulam Hyder,Maulvi Syed Amjad Ali,Husain Ali Khan,Sher Khan,Shaikh Lutf Ali,Shaikh Fateh Ali,Shaikh Najaf Ali ( Ex-Naib Kotwal),Shaikh Najaf Khan( Ex-Naib Thanedar),Shaikh Saifullah ( Tahsildar ),Qasim ALi Khan ( Kotwals),Sheikh Lutf Ali Khan( He was Raja Sindia’s wazeer), Sheikh Fateh Ali( Darogha), Sheikh Najaf Ali (Asst. Kotwal), Najaf Khan (Naib Thanedar), Masood Ali r/o Bheekpur, Tahir Ali r/o Ujhihni, Saqib Ali r/o Jalalpur, and Dildar Husain etc. The backbone of the revolt was the Landlords and army. Where they remained loyal to the British, any resistance was affectless. It was only the Bengal Army that wholeheartedly took part in the uprising and took one after other stations under his control in Allahabad that the Mutiny assumed the character of a mass revolt. The Villagers of the Doab threw off the yoke. The Muslims Zamindars of today’s Allahabad City namely from Rasoolpur, Samdabad, Beli, Fatehpur Bichhua, Baghara, Salori, Shadiabad, Minhajpur,Mehdarui, Bakhtiari, Bakshi and other villages in the city took the arms agsint the British and joined the sepoys. They plundered the destroyed the houses and properties of the Europeans. Shaikh Muhammad Hadi & Shaikh Faizullah of Behka plundered the tahsil at Pura Mufti and Thana on 7th June. Villagers from Kazipur, Fatehpur and Syed Sarawan also joined in their activities. Bharwari Railway station was attacked and two officials were killed. The entire police staff of Chail joined the revolutionaries. Entire Chail had risen in a war against the British and were fanatically hostile to them. The Entire Allahabad city of today is actually carved out of all the villages mentioned above. The uprising in the city soon spread to the different areas of district. The zamindars of Chail who were predominantly Muslims were most violently anti-British than any other group in Allahabad.As a result it was the severest one to control. The villages particularly mentioned in the annals who were front runners in the struggle were Beli,Baghara, Chhetpur, Mahgaon, Peepal Gaon, Syed Sarawan, Kazipur, Seonrha Fatehpur, Begum Sarai, Ujhihni , Bheekpur , Chail, Pawan, Shaikhpur, Bamhrauli ,Chak Rajpur, Inayatpur, Umarpur Niwan, Saidabad. KathGaon, Bara Gaon, Kashia ,Muhiuddinpur Ghaus, Najiara, Kurai, Lohra, Sarai Meja, Ghayasuddinpur, Rasulpur Deh, Minhajpur, Rohi, Nimi Bagh, Seondha, Sarai Salem, Fatehpur. A telegram dt.21/7/1857 by MH Court, Collecter of Allahabad to the Commissioner says that Pargana Chail is the epicenter of the rebellious activities in the district. Control of City It took around 2-3 days for the Maulvi Sahib to completely control the city and he was able to stop the plunder, arson and lootings in the city. The Trans-gangetic population lead by Old taluqdar families had also risen to overthrow British authority. Tejbal Singh Taluqdar of Daiya , Faqeer Bakhsh , ex-taluqdar of Kaurihar , Pargana Jhusi, , Ishwari Baksh, Babu Chhaterpal Singh of Shumapur were in open rebellion in Pargana Nawabganj. Raja Gulab Singh in Allahabad was also against British. The revolt was less felt across Jamuna. Some people tried to raise the standard of revolt but owing to the influence of the Rajas of Manda, Raja of Daiya and Bara , a general uprising could not take place. The Manda Raja acted stronly on the British Side. Dhakan Singh , Zamindar of Dhurawal was the chief instigator in that part. Iswari Bux, Babu Chatttarpal Singh of Shumapur was in open rebellion in Pargana Nawabganj. Tejbal Singh of Daiya, Faqeer Bakhsh ex taluqdar of Kaurihar, also tried to establish their authority there. It is reported that the majority of the Shia community and a minority of the Sunni community were not convinced by his call and they did not support him.As per Bhatnagar ‘ Only five Shia villages are reported to have taken part in the struggle independently and remained aloof from Maulvi Liyaqat Ali. They were Manuri, Saidpur, Bisauna, Asrawe & Mustafabad all in Chail.The rest of Shia population did not support him and their clerics did not consider the struggle to be a religious one. Maulvi Rahmatullah of Sunni sect also did not support the view for which he was rewarded enormously. A particular Shia family of present Kaushambi has tried his best to enlist their village in the freedom struggle but I am sorry there is no documentary evidence to second their view. On 14 June, Liyaqat Ali sent the Emperor a report in which he informed him that the whole district had joined the revolt, and 'Hindus and Musalman are fighting jointly against the British. Everything was being done but the fort of Allahabad was out of their control. There was a huge quantity of Arms & ammunition in the fort. If the revolutionaries could gain possession over it, the British authority would have completely disappeared from north India. The companions of Maulvi Saheb were large in number but were not trained soldiers.The next day he ordered to attack the fort but the Sikh soldiers foiled the bid. Savarkar says , had the Sikhs used their brains, the history would have been different. The native sepoys did not have heavy guns while they had to face cannon shelling from the Fort. On 15th June the British Army came out from the fort and a fierce fighting took place where a lot of senior soldiers of native army fell. Had the fort of Allahabad been captured , the entire history of this country would have been different. 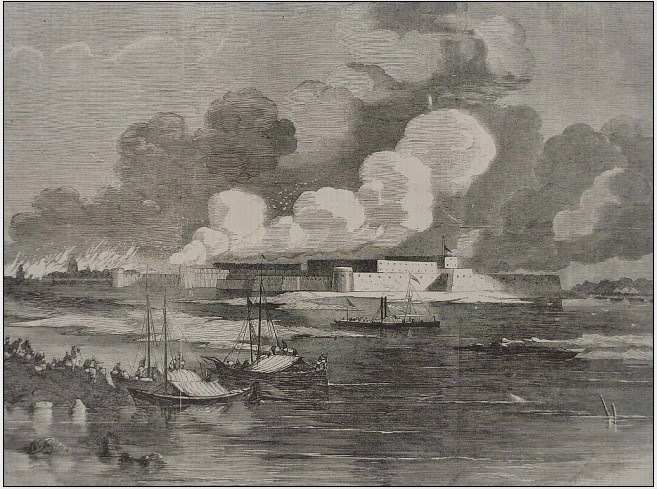 Even the British feared and prayed for Garrison at Allahabad because it was one of the strongest and most heavily stuffed garrison of the British Army. However it was Liyaqat Ali who was increasingly feeling crunch of weapons and logistic supports due to sustained confrontation with the British army, found it very hard to continue the struggle. The British army constantly was getting re-enforcement from Benares and Mirzapore. 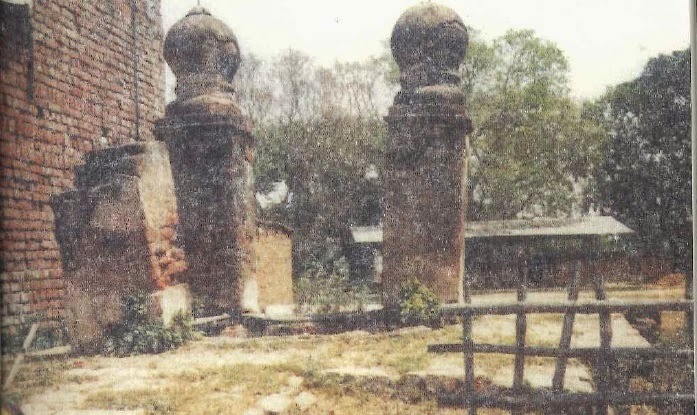 It is reported that Maulvi Liyaqat Ali mounted his cannons on the roof of the Original Jama Masjid near the Jamuna westwards to the fort, to break open a way into the fort. 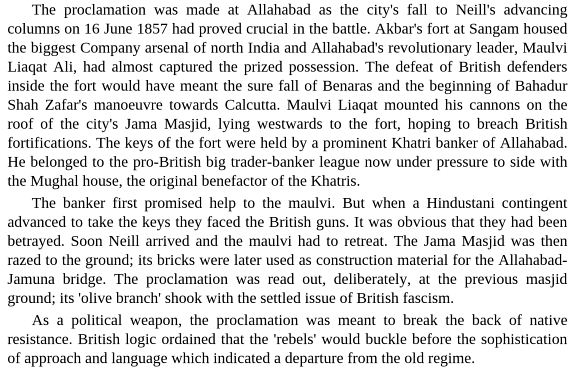 The Keys of the fort were held by a prominent Khatri Banker of Allahabad who promised initially to give him the keys but when Maulvi Sahib’s men asked him for the keys, he put them before the British Armed men betraying the Native sepoys. The next day neil Arrived and the beautiful Jama Masjid was razed to the ground , its rubble and bricks were used to construct the first Jamuna Bridge at Allahabad. The native sepoys tried so many times but could not surmount the fort while on 11th June Neil arrived on the other banks of Ganges. He stopped the drinking inside the fort and free access to the commissariat liquor supplies. Neil asked to pound the densely populated civilian areas of Kydgunj & Daraganj with their cannons. The heavy shelling resulted in heavy casualties. Some pro-british citizens in the city deliberately spread the rumours that the British Army is going to pound the city with Gunpowder and the entire city is scheduled to be burnt. This created a panic Panic spread and people ran with their belongings to the safer places. Maulvi Sahib & his army were busy making strategies while they had no parallel to the guns, cannons of the British Army and soon they found it difficult to sustain. Neil's army with Sikh regiment invaded the city and opened fire indiscriminately. Khusro Bagh, the head quarters , was attacked from the Railway station side and fierce fighting went on 16th June. 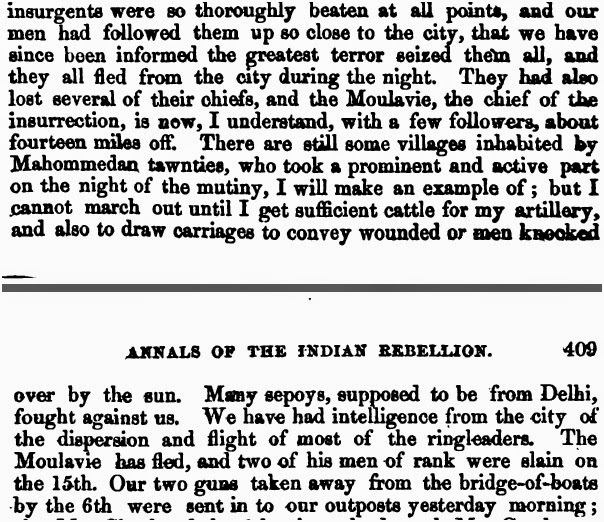 The British captured Daraganj on 12th June 1857 after a bloody showdown with Liyaqat Ali’s army. On 14th June 1857 British army along with Sikhs attacked Liyaqat Ali’s army but the brave men of Liyaqat Ali made them kiss the dust and take refuge in the fort. The Happenings at Allahabad were regularly reported to Delhi till he remained in Charge. He wrote a day before 16th Jun to Bahadur Shah Zafar that the Sikhs have held the fort vigorously and we have almost no ammunition left with us yet we have not lost hope. The British forces are rushing towards Allahabad via Benares but I assure you that no British would get a Dana or a drop of water from Benares to Fatehpur. Nobody would provide him that. I am sending you 500 soldiers with 5 Canons for your help. In this letter he has given details of the places & people he got support from. It is evident that irrespective of Cast Creed & religion , Hindu Muslims, Zamindars, Taluqdars, Govt Employees, Common man, even some Sikh solders of Ferozepore Regiment stationed in the Fort had also supported him but alas the providence has something else destined. 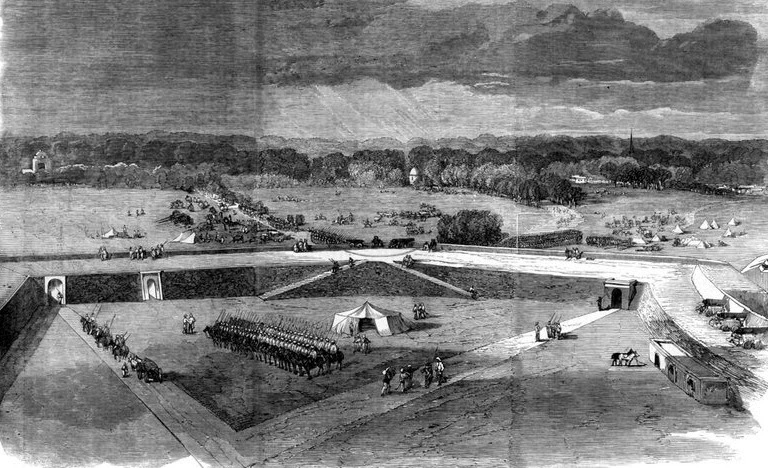 On the 16th June, Colonel Neil came from Benares and the Indian soldiers could not sustain the canons in Alopi Bagh. Liyaqat Ali had to take retreat along with his 3000 companions to Khusru Bagh.Colonel Neil tried to capture Khusru Bagh but could not succeed hence he spread news that he will undertake the massacre of the city of Allahabad. Liyaqat Ali had heard the news of the beastly act of British in Samdabad, Rasoolpur and other areas, so he decided to leave Allahabad with the hope that with his departure from Allahabad the innocent people of Allahabad may escape the massacre by British army. The Maulvi Sahib was also worried about the huge amount of Cash in the possession of his followers and it was finally decided for a small group of his followers to leave with that booty and this movement was kept highly secret. As soon as Maulvi Sahib left in the night of 17th, Khusro Bagh fell to the British Army. Liyaqat Ali left Allahabad on 17th June 1857 to save the common man of Allahabad thereafter started the atrocities and the brutal activities rarely witnessed by the heaven. On 18th June, The British army along with the Sikhs marched out to Jail and destroyed completely Samdabad and burned the villages till the cantonment. A new Kotwal Paswan Singh was appointed. Security was established in different muhallas. Trading activities resumed in Chowk & Sarai Meer Khan by 20th June. The hell broke loose on the inhabitants of Allahabad……. It is another bloody chapter that after the British recaptured Allahabad, they started the worst and most brutal game of indiscriminate killing of humanity that the sky would have ever witnessed throughout history. . It started with the burning of the villages and crazy hangings irrespective of man women and children. Colonel Neil and his associate Sikh soldiers presented the worst example of atrocities on the helpless. After this victory Colonel Neil wrote to the secretary, Government that he would completely destroy the city and the sub-villages around as the rebels would get help from there. Neill went berserk. He hanged natives in hundreds, and the highway was decorated with corpses hanging from trees. News of Neill's actions spread far and wide -- greeted as proper justice by the shocked British and with awe and revulsion by the natives. Neill's bloodletting may have, in fact, given rise to the events at Kanpur. Neil ordered the cruel task of mass killing and hanging of the people and burning the villages around Allahabad, Small children if found carrying green flags, were hanged without any question. Muhalla Chowk had seven Neem trees which were used to hang the people indiscriminately and were always full of dead bodies hanging. The Pathan population of Sadiabad and the Mewati Muslims of Rasoolpur became victims of worst type of massacre. The British demolished the Jama Masjid of Allahabad erected by Akbar situated on the Western side of the fort and converted it into an army barrack. Several entire villages near the fort were put to flames. Almost entire population was killed or ran for life in the city. Neil’s fusiliers killed every native whom they could catch and knew no mercy. They slaughtered nearly 6000 persons in Allah.abad alone. The entire district looked like a vast dreary wasteland dotted with charred houses and ravaged villages. A British business man of Allahabad was authorized to collect information about the revolutionaries of Allahabad. This British Business man was heavily indebted to various local Businessmen. First thing he did he got all the creditors hanged for fake charges of revolt so that he may not be required to pay his debts. The Zamindars of Chail who were the front runners and the most violent group during the uprising had to face the worst. The hand of repression fell heavily on them. The British counter-terror was out of proportion and exceeded all bounds. Insane and indiscriminate killing became the rage. Little boys who were guilty of nothing were summarily executed. Hundreds of men in Chail were hanged on trees because their faces were turned the wrong way when they were met on march by British Soldiers. Almost entire Taluqdari estates in the Pargana of Chail were confiscated. After the rebellion no Muslim landlord could regain one’s erstwhile estate and glory in the entire Pargana of Chail. Many of the leading men were hanged and they were reduced to being moderate to big landowners. Scores of villages were reduced to ashes and rendered desolate, deserted and waste. The revolt of 1857 opened a new phase in the history of India. The reigns of Indian Government were passed into the Hands of Queen Victoria, the then ruler of England. A minister of British Cabinet called Secretary of state for India was made responsible for administration in India. The Governor-General of India was hereafter called the Viceroy. Queen Victoria issued a proclamation and it was read at a Durbar held at Allahabad on 1st November 1858. Proclamation of 1858, at Allahabad. Actually this all forced the British Govt to make Allahabad the centre of the province. In 1834, Allahabad became the seat of the Government of Agra Province and a High Court was established. A year later both were relocated to Agra. 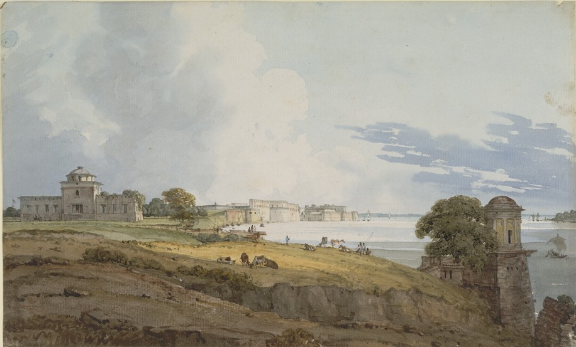 After the mutiny in Allahabad, the British truncated the Delhi region of the state, merging it with Punjab, and transferred the capital of the North-Western Provinces to Allahabad, where it remained for the next twenty years. The impact was so strong that in in Jan 1858, Lord Canning once again declared Allahabad as the Capital city, In 1868, High Court was also transferred back to Allahabad from Agra. Maulvi Liyaqat Ali left for Kanpur with 3000 followers & confidantes crossed the Ganges and reached Sangrur Camp and from there reached Kanpur and met Nana Sahib. Maulvi Sahib’s tactical escape from Allahabad was a rude shock for the Britishers hence they announced a reward for his arrest. It is reported that he stayed in Bakshi Sahib’s house at Mori Tola at Kanpur and roamed in Kanpur along with his followers freely. He got news about the atrocities of Neill in Allahabad which he regularly reported to Nana Sahib which enraged Nana Sahib who were determined to take revenge of Allahabad. Nana Sahib defeated General Wheeler at Kanpur and the British were allowed to leave Kanpur by boats on Ganges. It is where that the Sati Chaura Ghat tragedy took place when the hidden guns started fire on English Men & Women. It is that same place where Maulvi Sahib saved the life an English Girl ,the detail of which is presented in the following passages. When Maulvi sahib saw the defeat of Birjees Qadr and the fall of lucknow, concentrated his army and moved his base to the Gangapaar region of Allahabad. His operated from Soraon and adjoining villages successfully for quite a considerable time. His respect influence and aura was such that almost all the zamidnars of trans-gangetic plain supported him whole heartedly and it was quite difficult for the British to quell the uprising completely even after the capture of Allahabad. Till January 1858 , the army of Liyaqat Ali was in control of trans-gangetic area. A very strong force was present at Nusratpur Indigo Factory in a plan to attack the city of Allahabad. Brigadier Franks went ahead and led the assault on the Indian fighters there and defeated Liyaqat Ali’s men on 23 Jan 1858 which actually brought the end of his struggle in Allahabad. However his men were active till the end of 1858 in the partabgarh , Rai bareli area. Maulvi Liyaqat Ali was reported to have met with Raja Hanuwant Singh of Kala Kankar and Raja Gulab Singh of Tiraul with Taluqdars of Oudh who were jointly planning to punish the chiefs and headmen village who were loyal of the British East India COmpnay. 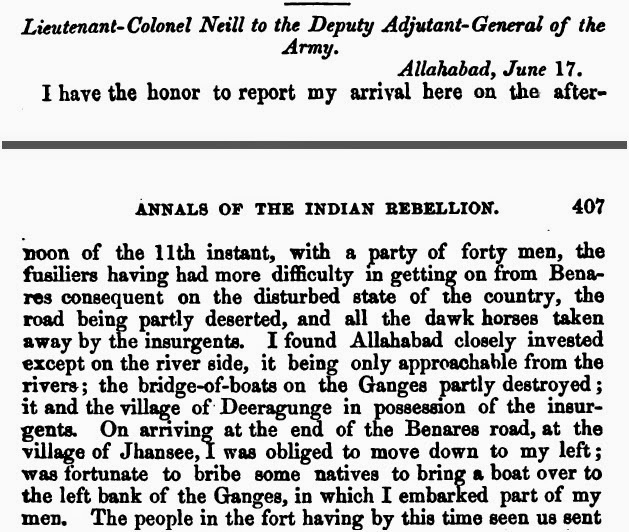 In July 1858, Anapur in Allahabad was attacked and the chief taken as a prisoner. The next day they punished the landlords of Nasirpur, Nawabganj , Tikri and other villages in Soraon. 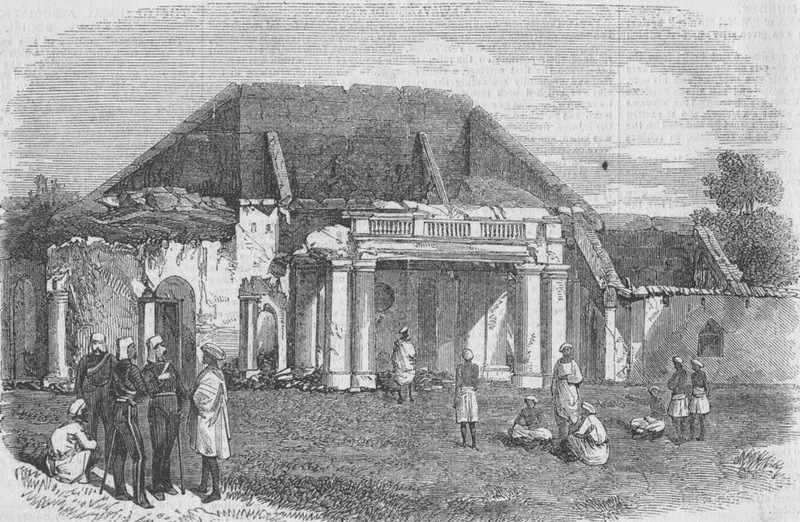 Phaphamau , Kaurihar area was again in their control till the end of 1858. The last major Battle when Major Berkely after crossing the river attacked the fort of Dahiyawan ( Raja Shivdatt Singh Bisen ) on one morning in July 1858 and surprised the entire army of Maulvi Liyaqat Ali . Dahiyawan fort served as the headquarters of Liyaqat Ali then. Colonel Berkeley left no stone unturned in the battle that left around 600 persons dead in which Raja Sangram Singh of Singraur alongwith his son Bisheshwar Singh died. However Maulvi Sahib managed to save his force and reached the Nazim’s camp at Ahladganj, Berkely tried his best to capture the Maulvi alive but it was not destined for him. For some time Liyaqat Ali kept fighting British shoulder to shoulder with Nana Saheb. But afdter Nana Saheb’s escape with his Chief Associate Azimullah Khan, it became difficult for Liyaqat Ali to stay on in Kanpur , therefore from Kanpur he went to Farrukhabad and from Farrukhabad he went to Lucknow and joined Maulvi Ahmadullah Shah and commanded the army against the British. He was present in the famous Chinhat Battle against the British and from there he followed the Maulvi Ahmadullah in Muhammadi (Khiri) where he was part of the interim government they had formed. After the martyrdom of Ahmadullah Shah he went ahead and fought bravely to get his friend Nana Rao freed from the men of Nawab of Rampur. From there he consorted Nana rao to Nepal and from there he directly went to Delhi.It is reported that he had met and joined with Begum Hazrat Mahal and went upto Nepal but did not like to remain in hiding. At Delhi he had reportedly met Bahadur Shah Zafar and went to Jama Masjid where he gave a fiery speech against the British. However Before the fall of Delhi, discerning the imminent danger he got himself underground. He managed to hide at different places. He was reportedly in North West Frontier in 1866.An officer Parson posted at Allahabad had written a letter on 24.2.1872 to the collector of Peshawar with a photo to identify Maulvi Liyaqat Ali. The Original letter & photograph is still preserved in the Archives at Peshawar. This is the original and only photograph present as of today. Before getting into the detail about the further activities of Maulvi Sahib we can have a look at his character and the reason he did not succeed in Allahabad. As some of you would know that in 1834, Allahabad had been declared the seat of the Government of Agra Province and a High Court was established. A year later both were relocated to Agra but the immediate after effect of the happenings of 1857 was that the British truncated the Delhi region of the state, merging it with Punjab, and created the North Western Provinces in 1858 and made Allahabad the capital of the new province, where it remained for the next twenty years. All the writers are unanimous that Maulvi Liyaqat Ali was a pious, God-fearing man of a very strong moral character. He was held in high esteem in all the sections of society. From the lower ranks till the Taluqdars , everyone heard him with respect and carried out his orders with love. The British who have not left a single stone unturned failed to find a single hole in his unblemished life and had to agree that the Faqeer Maulvi of Allahabad was a man of sanctity and was highly respected by all. “He is a man of extra-ordinary respect and decoration by his coreligionists of Allahabad is evident from the vast crowd of sympathizing Mohemmadans who assembled round this court house and on the 18th instantly when the case was first called up for trial. After assuming the leadership of the masses Maulvi Sahib faced many problems, the most urgent of them being the unity and consensus among rebels. After the outbreak when he reached Allahabad he tried to control the mob that had gone out of his control by that time. The looters had gone berserk but due to his efforts within hours the order was established in Allahabad. One section held that no scholar of Islam has any right to give call for Jihad and the other took the arm against the British as a political war and not the religious war. He had to try hard convincing from masses to classes to join the struggle. He took oath from all that no innocent would be touched. No animal, grain, grocery, provision would be looted or taken free of cost. No child or women would be touched. The war would also be against the British only and no personal accounts would be settled. The Anarchy, the confusion and the trouble that came in the wake of rebellion were controlled by him in a highly diplomatic manner by Maulvi Sahib. His character can be gauged from the episode of Amelia Horne which is given later in this article. See below. Ultimately this girl became instrumental in finding way to avoid hanging of Maulvi Sahib. 1) Lack of Capable military genius and Commanders. We know that almost all of his men were untrained soldiers who had no parallel to the disciplined and strained regular British Army. 2) Lack of resources as required. He had no arms & ammunition as compared to the British Garrison. 3) Most of the powerful local chiefs & feudal lords with a few exceptions, kept aloof & did not support the movement with a hope to get huge rewards. A lot of powerful Trans Jamuna and Ganga Talluqdars & Zamindars used their clout aganst his cause which was a severe blow to his plans. 4) Lack of sound character by the sepoys and locals, Some of the sepoys slipped away to their homes after the initial stage, some of them harassed the common man , even plundered and lost the sympathy of the civil population. Most of the area in Allahabad had already come under the sway of the rebels yet it was felt as if there was no coordination among various leaders despite the best efforts of Liyaqat Ali. Hindu Muslim Unity – The most outstanding feature of uprising at Allahabad was the unity and unison of Hindu & Muslim masses. It is noteworthy that both Hindus and Muslims came out in his support whole heartedly; especially the Pragwal Brahmins were the leaders from the city side. The Pandas and Brahmans exhorted the visitors and common man to dismantle every remaining British authority. The pragwal brahmans of Allahabad were most notable in the conflagration and influenced the hindu population to support them. Keene writes that the Pragwal Brahmans spread over the villages, abusing their supposed sanctity and their personal influence to mislead the simple credulous villagers; and the Maulvi flaunted his green banner. When authority recovered the upper hand these tracts were entirely deserted, and great difficulty and delay were experienced before the operations of peace could be renewed there. The rapidity with which the revolt progressed, the vast area which it spread proves that it enjoyed strong mass support. Those who sided with the British had to face obloquy and often social ostracism for the time being. The decisive evidence of the national character of the uprising is the presence of communal harmony it struck. The British tired their best to tide over the crisis with the well used policy of divide et impera. Sir Henry Lawrence wrote to Lord Canning (May 1, 1857) I shall watch for the differences of the feelings between the two communities “. The Emperor of Delhi and Nawabs of Bareli announced that no more cows should be killed in the land. On the other hand Nana Sahib and others declared his complete allegiance to the Emperor. The flag he unfurled at Kanpur was the crescent flat (as also his ancestral one). In all his correspondence including his letters to Maharaja Jung Bahadur of Nepal, Nan Sahib used the Islamic Hijri Era. His principal advisor was Azimullah Khan. Hindus & Muslims fought together. Out of the 272 Taluqdars of Oudh ( Awadh ) only 7 stood with the British during the Uprising. He strictly forbade killings of native Christians and indiscriminate killing of anyone in the city. He personally went to the dwellings of Christians and made sure that they were not attacked. The christians of the city never forgot him and always had good to say about Maulvi Sahib. Maulvi Sahib was an outstanding organizer. He was an effective speaker and an able commander. It was his impassioned preaching that enabled Allahabad and environs set file at the first spark of the Mutiny.Alike in peace and war, the Maulvi showed himself dauntless and daring leader of men. Maulvi worked so hard that Charles Bill observed "the freedom of country became so great that very judges and munsifs joined the secret society - History of the Indian Mutiny vol 1 p.268. Maulvi Liyaqat Ali’s area of operation was spread over up to Kanpur, Rohelkhand and Oudh. Maulana Liyaqat Ali was arrested and transported to Andaman & NIkobar Islands not for crime but for espousing patriotism. Thousands of his followers sacrificed their lives properties not for any personal gain but for the Nation India. The present generation hardly knows about their great deeds for the nation. The traitors who helped British find out and kill the Indian Revolutionaries were rewarded enormously and today they are the richest people in Allahabad but nobody knows where is the family of Maulvi Liyaqat Ali and what happened to them after that ? Rajas of Manda, Bara & Daiya were loyal throughout the movement and had been so till today. Pyare Mohan Munsif, Tahsildar Sirajuddin, Syed Ali Khan Deputy Collector, Sadat Ali Tahsildar Khairagarh, were rewarded with rupees and villages. Ali Suza who was Tahsildar of Chail and Maulvi Ali Sarwar got a reward of Five hundred rupees who acted as British Spies. Negupal Tahsildar of Kada , Gopinath Tahsildar of Phulpur were rewarded by Governal General. Rao Panch Bal Singh Tehsildar Khairagah was given the title of Raja and Rupees 3000. Lal Singh Taluqdar of Bara was made Raja and rupees 5000 as reward. Nanak Chand was given land in Phulpur and 10000 as reward. Ram Prasad Mahajan of Daraganj supplied Rasad to the British in fort, was awreded 4000 and a village. Maulvi Hafiz Rahmatullah who gave a fatwa against the uprising got a village in Kara and rupees 2000. Sri Narain thanedar of Muratganj got a reward of 3000 rupees, one house and a sword. 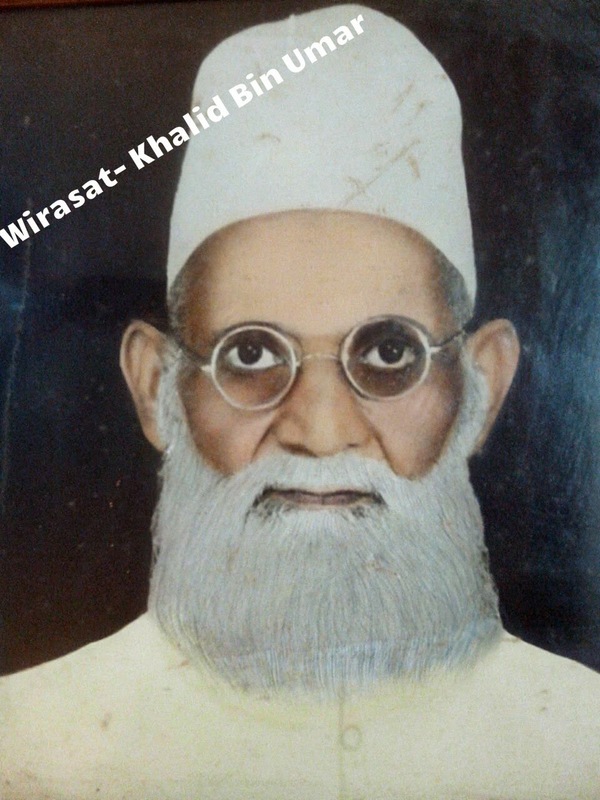 He went underground and went towards Gujarat, first at Baroda and thereafter arrived at Navsari near Surat and eventually he chose for his abode a mound at Lajpur and settled there introducing himself as Maulvi Hakim Abdul Kareem and started practicing medicine and soon acquired reputation as a famous Hakeem Abdul Karim . Hundreds of people became his followers there and in the disguise of Hakeem he exhorted and encouraged his followers against the British hegemony. Lajpur is a town in the district of Surat, located approximately 12 miles south of the city of Surat. The town has a large Muslim population and had always been the home of Ulama. A scholar from Gujarat confirms and gives a more authentic report about his settlement. Maulvi Liyaqat Ali Alahabadi escaped and moving at different places in disguise arrived at Navasari in south Gujarat in about the year 1861-62. Then he stayed at Lajpur near Sacnin for some time and finally settled at Sachin. The nawab of Sachin respected him, treated him well and helped him build a house there. Therefore he actually lived in Sachin , which was a princely state belonging to the Surat Agency, former Khandesh Agency, of the Bombay Presidency during the era of the British Raj. Its capital was in Sachin, the southernmost town of present-day Surat district of Gujarat State. Nawab Abdul Karim Mohammad Yakut Khan II (b. 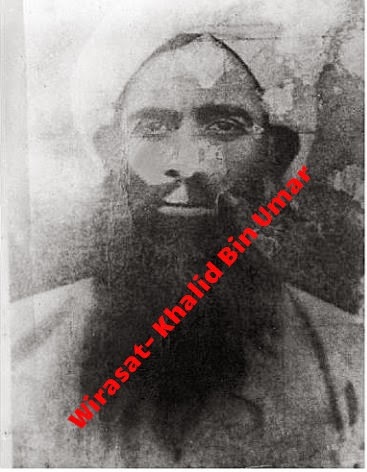 1802 - d. 1868) was the reigning Nawab who was very impressed with the personality of Hakeem Abdul Karim aka Maulvi Liyaqat Ali and he was the one who became his actual support by keeping him under his patronage. However after his death , the estate was succeeded by his son Ibrahim Mohammad Yakut Khan II (b. 1833 - d. 1873) , he seemed to have supported him initially but he was alarmed at the increasing influence of Maulvi Sahib and advised by some “Faithful” servant of the British that if he did not report the matter , then the Intelligence would eventually sniff and would endanger his entire estate as well. Therefore he was the one who actually started creating problems for Maulvi Liyaqat Ali. The Maulvi Sahib got wind of the plan and he skipped away from Lajpur and reached Baroda and stayed there for some time. Thereafter he shifted to Bombay where he stayed with Mr.Baqir Ali, a well known businessman of Bombay. He lived in Bombay conducting lectures on religious issues regularly when oneday two amongst the audiences recognized him who he originally was, went straight to Poona and send messages to the the Governor who immediately telegraphed to Sir Frank Henry Souter, commissioner of Police Bombay to apprehend the suspected preacher in Bombay.Mr Souter was absent in Bombay when the telegraph arrived. Mr. Edginton managed to get orders from government to arrest Maulvi Abdul Kareem which were received moments before he was about to board a train from Byculla railway station. Even after capture then there was no proof to show that he was indeed the same Liyaqat Ali, the ally of Nana Sahib. The task of proving this was given to Mir Abdul Ali. He got two native gentlemen sent down from Allahabad to Surat to speak to the prisoner and verify his identity and the moment they saw him , they recognized him as Maulvi Liyaqat Ali of Allahabad, the governor of Allahabad in the rebellion .This was 7th July 1871. The Inspector Mir Abdul Ali who actually caught him was rewarded enormously and was promoted, made a Khan Bahadur alongwith other rewards. Some other reports suggest that he was leaving for Bombay from where he intended to go for Hajj when he was apprehended. Another Book detailing his capture at Byculla Railway station. In his recent book Mr.AP Bhatnagar has wrongly stated that Maulvi Liyaqat was apprehended from Bombay VT Station. His capture resulted in a near riot. His capture was such a big news that it was reported in the times London, and the New York Times and the Sydney Morning Herald. The Maulvi Sahib was brought to Allahabad for the trial via Jabalpore. Writer Adam claimed the Liyaqat Ali escaped and managed to elude capture for more than 14 years, he suggests that he did not sit back , he was working towards the goal of Indian cause. 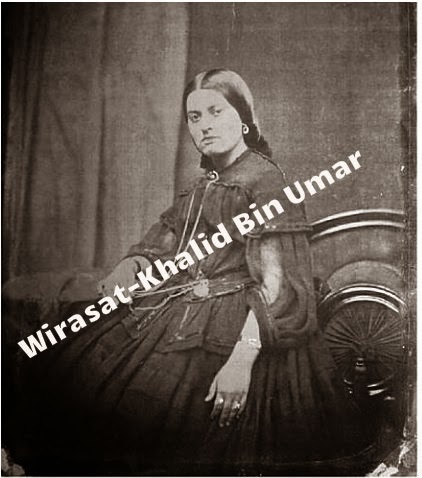 it is alleged that he travelled to Baghdad and Muscat outwitting British detection by changing his name and appearance, When he was arrested in 1871 the police found concealed documents written in script code. There were plans to overthrow the British government alongside 2000 Rupees in a gold ingot hidden in the crystal tip of a bamboo stick in his possession. Charles Hopes, the then collector of Surat stated that Maulvi Liyaqat Ali was travelling around sine 1857 using alias Maulvi Abdul Kareem protected by Nawabs of Sachin and others. He had a great reputation throughout the surrounding country as a holyman and Hakeem and evidently possesses great authority. He added that sine rebellion he had been living a life of respectable Muslim while secretly preaching about seditious activities. 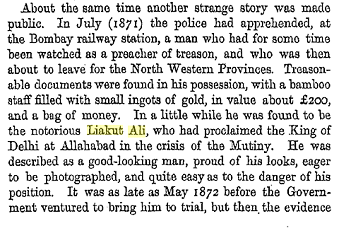 Liyaqat Ali spend a year in Jail awaiting Trial and on 18 July 1872 , he was brought before the Allahabad sessions court. The courts described him as a man of 45 years of age, a man proud of his looks and was happy when he was photographed. After the charge was read of him he pleaded guilty. He pleaded that he had played an important role in the restoration of order and protection of govt properties, telegraph wires and livestock as well as the lives of Europeans and Indian Christians all of which under rebel attack. He went on to claim that he had fled only because he had been greatly distressed at his motives being misunderstood by the govt. Finally he added that he was a man of humble origin and he had not used the revolt to reclaim past privileges and he had -not acted out of a desire for personal gain. The govt pleader Mr. Dillon surmised, He was simply chosen for his religious influence, he was told if he did not do so he would incur the displeasure of King. He further claimed to have saved the lives of several ladies and gentleman at Allahabad. He had dressed even one of them in native clothes and passed her off as his sister. “My people brought me a European woman, I do not know her name, I do not recollect how she was dressed, When she was first brought to me , I told my people to dress her in Hindustani Clothes, I took care of her in a garden. I kept her with me till the nana was vanquished, then I took her with me towards, Fatehgarh, I managed to save the woman whom I had been passing off as my wife and ran off with her. I saw there was danger for me so i sent her to Allahabad with a follower of mine when I reached Lucknow I heard she had reached the house of her relative Mr. Florest. I never saw the man again whom I sent with her, then I became a Faqeer and went to the Nawab of Sachin”. The woman who actually turned the entire course of the proceedings and which he referred to was Amelia Bennett, who in a dramatic twist appeared in Liyaqat Ali's defense. Amelia described that she was 33 years of age , daughter of Captain Horne , how she had got into a boat in Kanpur when the a group of Europeans left the entrenchment in the belief that they were to be shipped upriver, but were fired upon as they boarded boats in Sati Chaura Ghat. As shots began a sawar named Ismail Khan had plucked her out of the water and taken her to Liyaqat Ali’s house. She went on to say, The Maulvi asked me if I would like to be a Muslim or forfeit my life, I said I was willing to die. I don’t think he was serious in taking my life, they treated me kindly. Then he took me to Bithoor and then to Fatehgarh and from there to Lucknow at a relative’s house. He categorically stated that no insult was ever offered to me throughout her journey. Now let me tell you something about this lady. Amelia Anne Horne was born in Calcutta on 9 January 1839. Her father Frederick Horne was a mariner who died when she was young and her mother Emma remarried a few years later. In 1856 the family left Calcutta for Lucknow moving to Cawnpore. The family was of past rich, having first language French but she also knew English and Hindustani. Initially they British did not reveal her story but later on some pulp fiction guys tried to titillate those readers and coloured her story as if she was mistreated and blemished with a stigma that lasted with the poor lady for the rest of her life. According to Judge A R Pollock, large crowds of sympathetic Muslims, would gather at the court to get a glimpse of the Maulvi. Around 5000 persons gathered daily with unprecedented scenes of anxiety to see and hear how the things were going with him. One day someone rumoured that maulvi Sahib has been freed and the entire city ran towards the courts to get a glimpse of him that created a near riot in the city. “ The court allows that the prisoner is not shown to have taken any active part in the perpetration of the gross cruelties of murders of Europeans but at the same time whilst the rebellion lasted at Allahabad and Cawnpore, devoted to the rebel cause and he has now been brought to trial not by any act of submission or his own but he is being captured by the Police of Bombay whilst living under another name. 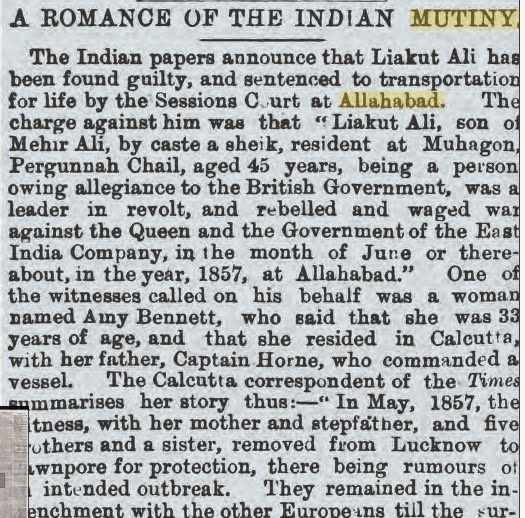 “ The Prisoner Liyaqat Ali having confessed to the charge that he being a person owing allegiance to the British Government was a leader in revolt and rebelled and waged war against the Queen and the government of the East India Company in the Month of June or there about in the year 1857 at Allahabad. The Court finds that he is a guilty of an offence punishable under section 1 Act XI of 1857 and directs the said Liyaqat Ali shall be transported for life. After he was sentenced, he asked the judge to let him visit his village. He was allowed and he came to Mahgaon, went inside the mosque prayed two Rakahs of Nafl and met the relatives present there and sat in the closed Horse Wagon, bid a final farewell and went away. Maulvi Abdul Subhan Sahib of Malak Mahgaon was one of the persons who saw him at that point and narrated this at the beginning of this century to the old timers at Mahgaon. It is important to note that since 1857 till 1871, he spend 14 years out of Allahabad and mostly in Lajpur, Surat. It is reported from the old timers that he even came to visit his mother at Mahgaon in 1869 and went to visit his cousin at Asrawe and that tells about his valour, courage and unprecedented managing capabilities. Two of his daughter’s sons Abu Ahmad and Kabeer Ahmed were sent to meet him at Maulvi Sahib’s request where they lived with him till 1892. I am sure Maulvi Sahib would not complain as in the following urdu couplet. main woh be-kasi ka mazaar hoon !! However the fact is that the grave is in good condition and taken care of by the locals very well. Grave of Maulvi Liyaqat Ali, South Point, Off Coast, Port Blair. One of his co-inmates was Sher Ali Khan who killed Lord Mayo in Andaman when the latter visited the place after which no British General visited the place. Lord Mayo is the one who gave thename to the famous Mayo Hall in Allahabad. Capt. W.B. Birch a British Officer who was stationed at Port Blair in 1872 in an informal interview with Colonel Cadell had revealed a lot of first hand information about Maulvi Liyaqat Ali when he was an inmate there. “Sir, Liakat and I came to Port Blair at about the same time, in 1872, shortly after the assassination of Lord Mayo”, “He was one of the last of the mutineers to be caught, and one of the wiliest and most dangerous. But there’s an element of romance in his story, which makes it different from that of the others.“There was not a shred of evidence to arrest him as no one came forward to identify him as the same Maulvi against who a warrant was pending since 1858. Meanwhile intelligence was received that he was in Bombay and about to leave the city for an unknown destination. Assistant Commissioner of Bombay Police MrEdgington managed to get orders from government to arrest Kareem which were received moments before he was about to board a train for Central India from Byculla railway station. “At the time of arrest Liakat had with him a strange looking bamboo stick, with a crystal knob. When the knob was unscrewed it revealed a hollow space which contained gold ingots. The documents in his possession were in code. 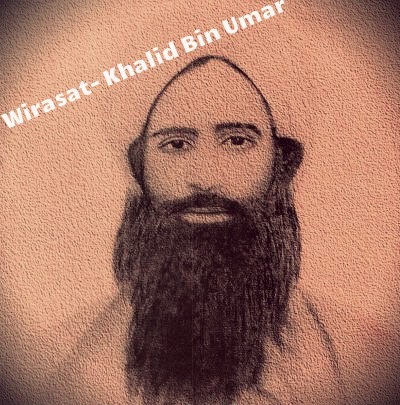 Mir Abdul Ali deciphered them, revealing a secret plan to overthrow the British. Some writers have mentioned that he is lying near the famous Aalim Scholar, Poet and linguist Maulana Fazal-i-Haq Khairabadi with whom Maulvi Liyaqat Ali had a beautiful time but the historical fact is that Maulana Fazl-i-Haq had died 11 years before Maulvi Liyaqat Ali reached the place. I undertook a thorough research on this subject and spent a good amount of time with a lot of old records to find out the details of his descendants and what I found is as follows. 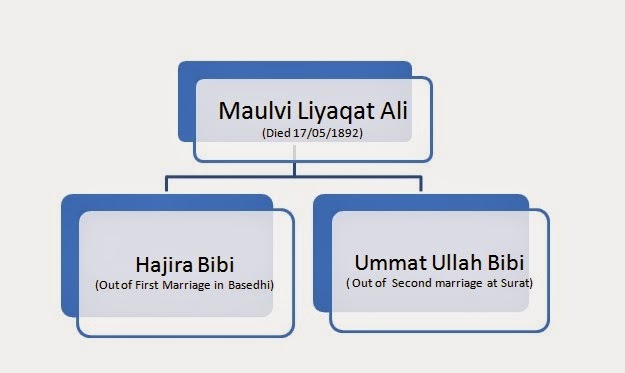 Maulvi Liyaqat Ali married twice but he had no son. Thus there is no one from his direct lineal descendant however he had two daughters from two wives and the descendants of those two daughters are present. One family is in India and the other one in Pakistan. 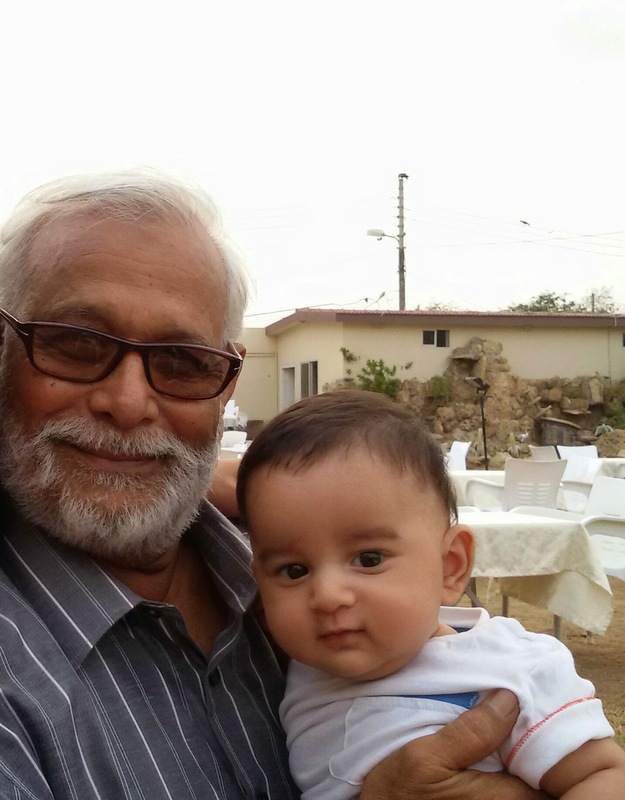 Qazi Zameer Ahmad and Qazi Haseen Ahmad few years back. He had a daughter from this first marriage named Hajira Bibi. This Hajirah Bibi was married to One Qazi Abdul Azeez of Seondha (or Sewndha a village in Pargana Chail on the banks of river Yamuna). Now this Qazi Abdul Azeez had four sons namely, Qazi Ayub Ahmad, Abu Ahmad, Wali Ahmad and Kabir Ahmad Sahiban. Actually it was Qazi Abdul Azeez, the son-in-law of Maulvi Sahib who shifted from Seondha to Mahgaon to succeed him in the last century and his grandsons are living in Mahgaon and Allahabad today. The Maulvi Sahib married secondly in Surat and again he had a daughter from this marriage whose name was Ummat’Ullah Bibi. This Ummatullah Bibi was married to Jb. Ameer Hasan of Mahgaon. Now Ummatullah Bibi had two sons named Hafiz Nazir Ahmad & Ahmad Husain and two daughters namely Khatoon Bibi & Zaitoon Bibi. Now this Ahmad Husain died without an issue, whereas the sons of Hafiz Nazir Ahmad migrated to Pakistan in the 1960s and never came back and hence putting an end to their association with Mahgaon. It was Hafiz Nazir Ahmad who handed over the torn Kurta Pyjama of Maulvi Sahib to Pt. Jawahar Lal Nehru for the Allahabad Archives.It carries a round metal token bearing no G439 on one face and GOFC on the reverse. Hafiz Nazir Ahmed had no issue from his first wife from Kath Gaon. He married again with a Burmese woman from whom he had 2 sons and 3 daughters. 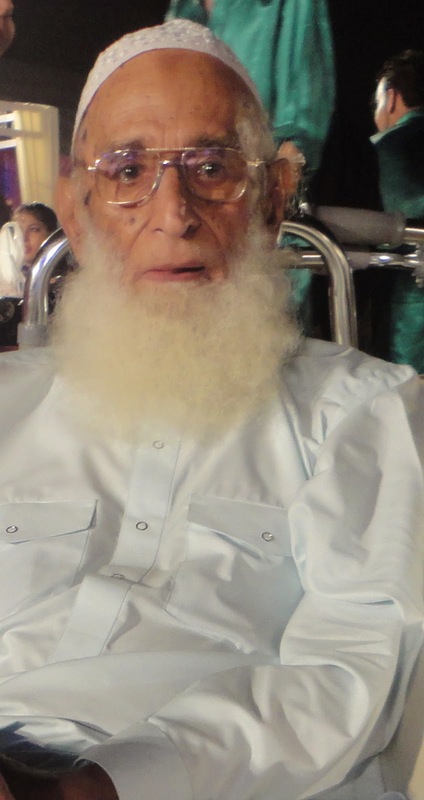 Zameer Ahmed Jafri (died last year) and Zaheer Ahmed Jafri was younger with three sisters Jameela ,Maimoona and Hafsa. After the independence of India, The govt of India tried to locate his descendents in Mahgaon. Since Maulvi Sahib had no son,his daughter’s children were recognized as his descendents and were issued pensions for Freedom Fighters. The eldest one was Hafiz Nazeer Ahmad who actually had handed over the Kurta , uniform and sword to Jawahar Lal Nehru which was enshrined in the Museum at Allahabad. 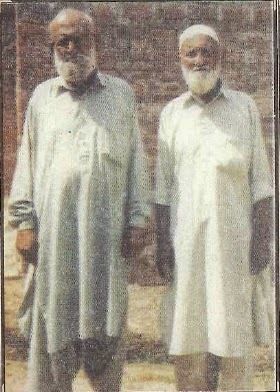 Later on Hafiz Nazeer Ahmad’s two sons migrated to Pakistan while Qazi Abdul Azeez’s children became the only reminiscent and descendents in India. The following were issued pensions for the descendents of freedom fighters. As mentioned earlier Maulvi Liyaqat Ali had an uncle named Shaikh Daim Ali who was employed in British Army posted at Jhansi.It is reported that he married a lady who was a close relative of Raja of Jhansi named Chanchal Bibi. After marriage this Chanchal Bibi came and settled in Mahgaon. She actually extended and built the mosque along the GT Road that was later known as Chanchal Bibi ki Masjid. Daim Ali & Chanchal Bibi had a daughter. The daughter Asaan Bibi d/o Daim Ali was married to Jb. Zainuddin of Manjh Khurd of the same village. 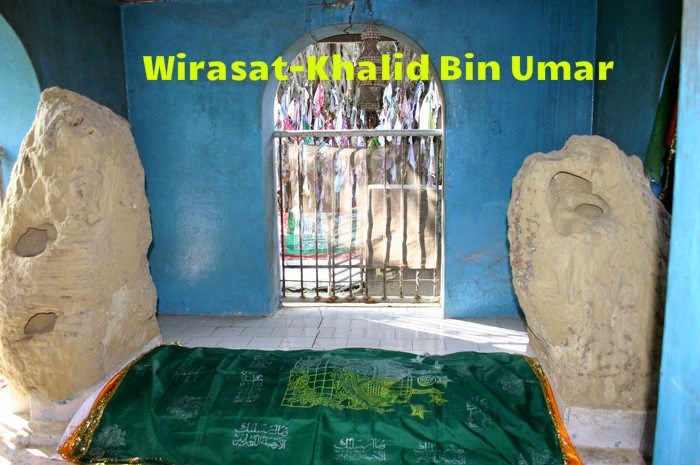 Chanchal Bibi was buried in the precincts of the same mosque. This mosque is being resonctructed these days and her grave has also come under the extension getting overlaid and out of sight. I don’t know why the name of Maulvi Liyaqat Ali was buried in the history books only and he was overshadowed with the other heroes as well. The apathy of the scholars & historians is evident from the fact that they slept over the original records for the last 150 years. Dr. R. K. Misra Director of Allahabad Museum in his interview published in Times of India issue dated 27.4.2006, claimed to have dug out the said basta No: 43 file No: 37 but expressed his helplessness on the ground that the details are in Persian Language and in-spite of his best efforts he failed to get the same deciphered. In-spite of the above interview, no one from Allahabad took up the cause to research in detail on the subject. Thousands of scholars came studied, researched and went away but how many of them took pain of travelling to Mahgaon and do a sincere effort to collect and revive the memory of the great son of the soil ?? We wrote about Delhi, Calcutta and even UK and USA but not about our own man ? 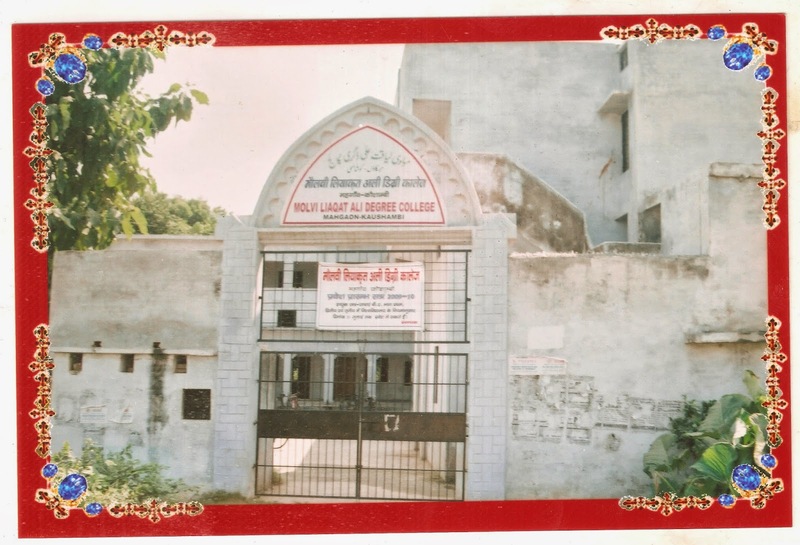 In the past decade, a local group of committed gentlemen from Chail formed a society and established a Degree College in the memory of the great man that is known today as "Maulvi Liyaqat Ali Degree College at Mahgaon. It has been recognised by Kanpur University and is catering to the needs of the students in that particular area. Chail Welfare society as it is known has a library in Kareli in the name of Maulvi Sahib for the aspiring students. The first sincere attempt to know the great man was done by one from his own village. Maulvi Abdul Bari Aasi” of Mahgaon firstly wrote the clear cut details of his early life and origin in an Urdu Magazine “Al Jamiat” in 1958. The 1857 revolt, which had forged an unshakable unity amongst Hindus and Muslims alike, was an important milestone in our freedom struggle - providing hope and inspiration for future generations of freedom lovers. However, the aftermath of the 1857 revolt also brought about dramatic changes in colonial rule. After the defeat of the 1857 national revolt - the British embarked on a furious policy of "Divide and Rule", fomenting religious hatred as never before. Resorting to rumors and falsehoods, they deliberately recast Indian history in highly communal colors and practised pernicious communal politics to divide the Indian masses. That legacy continues to plague the sub-continent till today. However, if more people become aware of the colonial roots of this divisive communal gulf - it is possible that some of the damage done to Hindu-Muslim unity could be reversed. If Hindus and Muslims could rejoin and collaborate in the spirit of 1857, the sub-continent may yet be able to unshackle itself from it's colonial past. Hum ne yahi paya ke bura nam na paya" !! 1. Anderson, Clare. The Indian Uprising of 1857-8: Prisons, Prisoners, and Rebellion. London, 2007. 2. Barter, Captain Richard The Siege of Delhi. Mutiny memories of an old officer, London, The Folio Society, 1984. 3. Campbell, Sir Colin. Narrative of the Indian Revolt. London: George Vickers, 1858. 4. Collier, Richard. The Great Indian Mutiny. New York: Dutton, 1964. 6. Fitchett, W.H., B.A., LL.D., A Tale of the Great Mutiny, Smith, Elder & Co., London, 1911. 7. 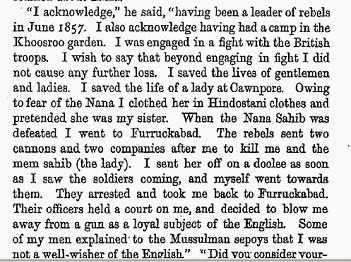 Inglis, Julia Selina, Lady, 1833–1904, The Siege of Lucknow: a Diary, London: James R. Osgood, McIlvaine & Co., 1892. Online at A Celebration of Women Writers. 8. Innes, Lt. General McLeod: The Sepoy Revolt, A.D. Innes & Co., London, 1897. 9. Kaye, John William. A History of the Sepoy War In India (3 vols). London: W.H. Allen & Co., 1878. 10. Kaye, Sir John & Malleson, G.B. : The Indian Mutiny of 1857, Rupa & Co., Delhi, (1st edition 1890) reprint 2005. 12. Malleson, Colonel G.B. The Indian Mutiny of 1857. New York: Scribner & Sons, 1891. 13. Marx, Karl & Freidrich Engels. The First Indian War of Independence 1857–1859. Moscow: Foreign Languages Publishing House, 1959. 14. Pandey, Sita Ram, From Sepoy to Subedar, Being the Life and Adventures of Subedar Sita Ram, a Native Officer of the Bengal Native Army, Written and Related by Himself, trans. Lt. Col. Norgate, (Lahore: Bengal Staff Corps, 1873), ed. James Lunt, (Delhi: Vikas Publications, 1970). 15. Raikes, Charles: Notes on the Revolt in the North-Western Provinces of India, Longman, London, 1858. 19. Sen, Surendra Nath, Eighteen fifty-seven, (with a foreword by Maulana Abul Kalam Azad), Indian Ministry of Information & Broadcasting, Delhi, 1957. 20. Thomson, Mowbray (Capt. 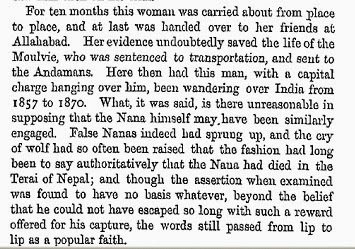 ), The Story of Cawnpore, Richard Bentley, London, 1859. 21. Trevelyan, Sir George Otto, Cawnpore, Indus, Delhi, (first edition 1865), reprint 2002. 39. The Pioneer 27 July 1872. 40. The Indian Govt journal in 1976 published from Andaman & Nicobar carries his name, Published by Publications divisions, Govt of INida, Patiala House. 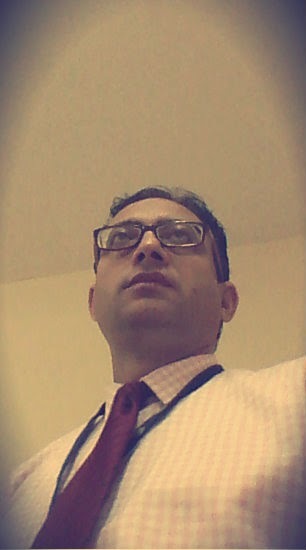 New Delhi. 52. The times, 11 August 1858 ( The first account of her captivity was sent to Governor General Lord Cannning in 1858 and published in The Times that year. Well done Khalid Bhai , its quite interesting and very well explained . Haq ada kar diya. Molvi sab ki yad jinda ho gayi. Khuda ki kasam kamaal ka kaam karte ho yar. likha ya ki jinda kar diya hai molvi sahib ko . Umar bhai, most comprehensive , accurate, honest and complete research work till date conducted on maulvi sb. on behalf of my entire family I thank you for your your very hard and selfless work which will benefit not only us as clearing many confusions and know our virasat but also benefit coming generations . I have still not completed your well researched treatise. I viewed Moughal lost their throne in the defeat of War of Baxter. The mutiny or war of independence of 1857 was last struggle of decadent privileged few.However I would comment after finishing the book(?). Venita Banerjee ...It has been an excellent comprehensive article on lost history ,ever so grateful for the hard work of unravelling details that will benefit generations to come .All Indians must read this & comprehend the seeds sown & sacrifices made for the freedom of our country in unity as one so as to remove the British policy of divide & rule that shows its horns till this day. This is a great job. These unsung heroes make people's history and promote "connectedness" that has kept humanity alive so far.